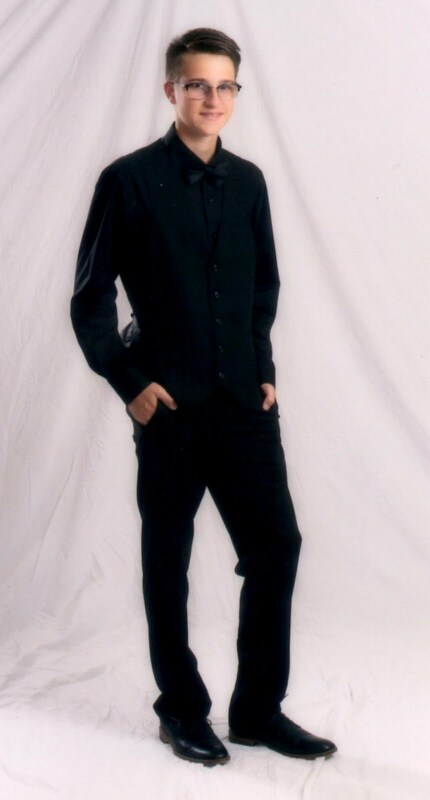 Hi friends. Hope everyone had a good Tuesday. I had my card 90% done yesterday, then got side tracked and never finished it until tonight. This card is made using an old Hampton Art Stamp. I love her, and if I had to pick only a few of my many stamps to keep, she would be in that lot. I've used her over the years for many occasions and I never tire of seeing her looking back at me from the shelf. See what I mean, that face!!! and the fancy label that the teddy girl is mounted on. White textured card base. Pale Pink Satin bow. Hearts from a small punch. Awwwww such a cute teddy, I can see why you love her so much. The colours are gorgeous and I love the layout. really a cute image and stamp. so lovely. you colour the bear so well!! nice card. Oh you are so right, Sue, that face. It's precious. I love how you mounted her on that die and the scallop card base. Please forgive me for not being around the past couple of weeks. I've been filling in at work full time and a stint with a horrible cold that won't leave my lungs. On top of that I've pulled my back out so crafting has been out of the question lately. Even sitting at the desk hurts and there is no energy left over from work. I hope to get back to normal within a couple of weeks. Enjoy the day. We may be in for a big storm Friday, I assume you will get a part of that also. Stay safe. She would be my favorite too. 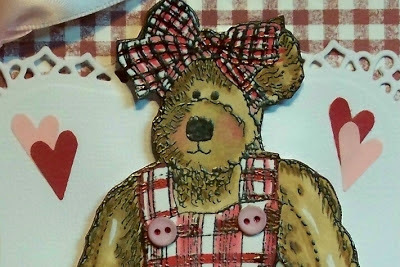 She reminds me of one of my Boyd's Bears. Gingham and hearts are the perfect accent for her. 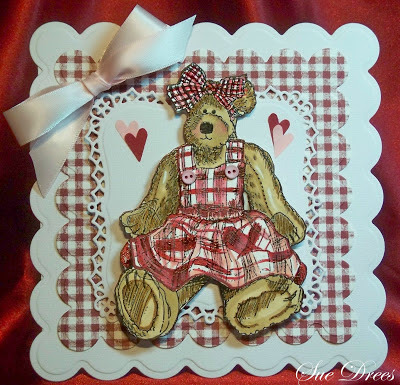 o what a cute bear Sue , beautiful card. Beautiful card and the image is fabulous! Wonderful job of colouring her and love the gingham! Oh such an adorable card and yes that image would be a keeper if I had it too! Thanks for joining us at A Gem of a Challenge this time! These type of stamps never get dated-it is just eye catching! cute card! you are right she is an adorable image and you did a great job coloring her fur texture for our challenge on CMC! thanks for joining in!